GENDER: Boy, and based on his daddy’s good looks, aptly named Beau Hudson. WEIGHT GAIN: 17 pounds as of 26 weeks. Baby is growing like crazy, if my stomach is any indication. Lately, by the end of the day my belly is so tight and heavy, but then I’ll wake up in the morning and feel 10 pounds lighter and reach down to reassure myself I didn’t sleep on my stomach the night before and smash the baby. Nope, still there. But it’s amazing how much lighter and refreshed I feel in the morning versus the end of the day. CRAVINGS: Yogurt. Ice-cream. Ice dream. You name it. I’m really craving one of those places where you do it yourself and pick your yogurt and toppings. I don’t do fruit on yogurt or ice cream, neither do I buy the pinted stuff with fruit or nuts in it. I go for flavors with lots of chocolate, peanut butter, coffee or caramel. The richer, the better. Unfortunately, or maybe fortunately for little Beau, there is not a specialty yogurt shop anywhere close to my house. This is the one and only reason I have not satisfied this craving. 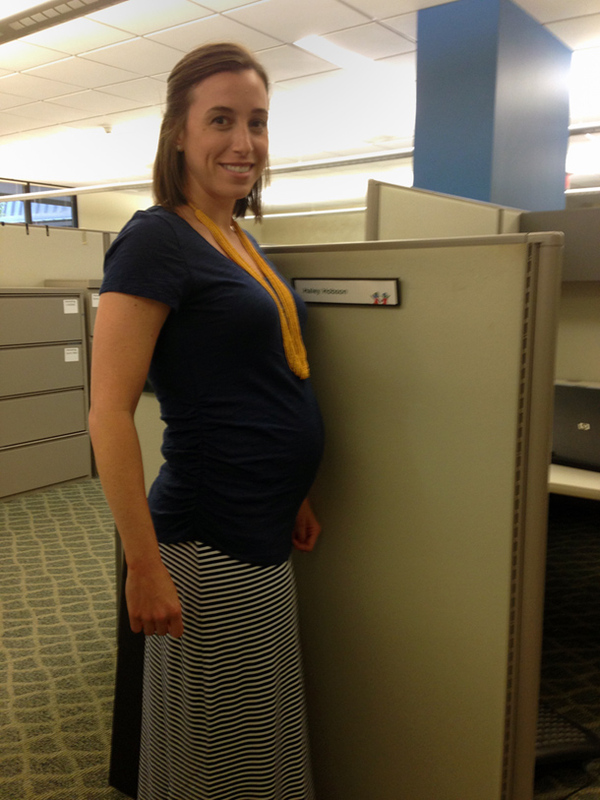 MATERNITY CLOTHES: I broke out the maternity maxi skirt this week (pictured above) and it is amazing. I have plenty of room to grow in it and I love that it’s not a full panel. If I start to swell or retain water during the final months of my pregnancy since it will be so hot, this is a great option that will cover any kankles 🙂 My maternity tops are really starting to fit and accentuate the bump. Still have to grow into a couple work dresses and skirts, but I’ll get good use out of them as the heat ramps up this summer. WORKOUTS: On Monday, I took JM for a stroller walk at the Silver Comet trail. He was tired so I was hoping he’d rest and I could walk a couple miles with a change of scenery. We ventured a mile out, and right as we turned around JM threw a tantrum in his stroller, his third in 24 hours. I think he wanted out so he could walk around himself, but that trail has tons of road bikers zooming past, so there’s no way he could safely walk the path. So yes, I was ‘that mom’ who pushed a stroller with a flailing, crying toddler one mile back to the car while sweetly smiling at passersby as if nothing in the world was wrong while inwardly cringing. On Tuesday afternoon, James entertained JM at the small park near the gym so I could work out with the 5:30 p.m. class. It is very, very rare that I get a chance to WOD with one of CrossFit classes, and I forgot how great it was to do the full warm-up, not rush through a WOD and not have to keep a roving eye on a roaming JM. I did have to scale, but I got a great workout in. And it’s back to the gym this afternoon for me for another WOD. SYMPTOMS: It’s been a pretty stressful week for me dealing with house-buying issues, and as a result, I’ve been internalizing my stress. Not on purpose, mind you, but my stress has always manifested itself in my body. I unknowingly clinch my jaw, take shallow breaths and tighten my shoulders, only realizing this after my body is aching and my head is pounding. Being pregnant, I think the stress has manifested itself in my belly. The bump has felt pretty crampy for the past few days, and little Beau has tried to not so gently remind me to loosen up by kicking and pounding me from the inside like a crazy child. Now that it’s the end of the week, I’m hoping to shrug off the stress and maybe even indulge in that yogurt. And if JM could avoid any tantrums this weekend, that would be icing on the cake. I’m so excited to be entering into the third trimester next week!